The producers interviewed 98 year old John Arnold, former assistant city manager of Interstate Theatres in Houston whose career spanned the company's history from 1927 to 1973. At one time, he was manager of nearly every theatre in the Houston branch and in Austin including the Austin Paramount, the Houston downtown Kirby and Majestic, and the suburban River Oaks (his wife ran it too while he was in the army), Eastwood, North Main and Yale. Of particular interest were his stories of being an early sound checker when sound films were first released and the track ran on a synchronized (sometimes) LP record, the beginnings of the first candy counter (prior to that there were only coin operated machines in the theatres), the theatre contests like Battle of the Cowboys (pick you favorite western star), the introduction of Cinemascope and 3D to battle the new competitor, television, and the first days of integrating the theatres. 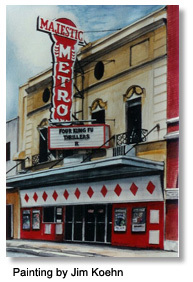 The interview was conducted in Houston's Majestic Metro which originally was named the Ritz. The Ritz was part of an independent chain of theatres owned by Will Horowitz. Interstate,though, had for some time a 50% ownership interest in the chain which also included the Iris (Jack Valenti worked here as a 14 year old usher), The Texan, and the Uptown.